As I mentioned Monday, I have a couple more pieces from Cabi's new Andiamo collection to share, and today I'm wearing the Plaza Top. 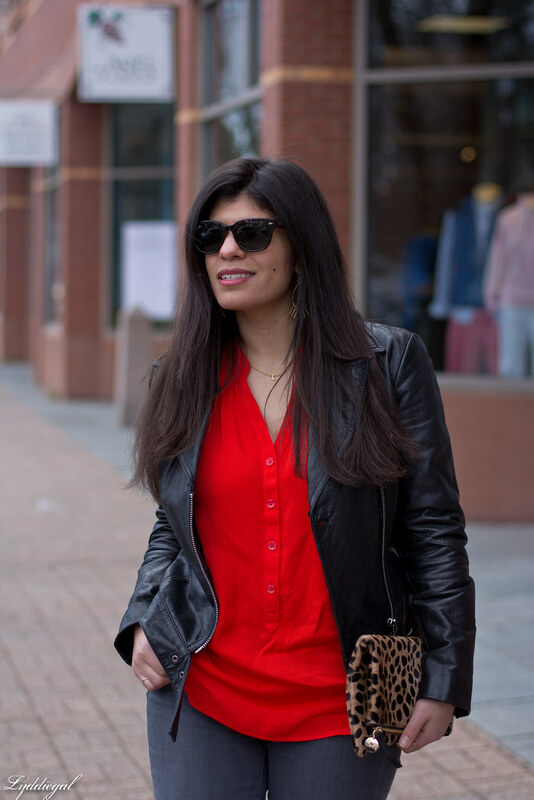 This sleeveless blouse is perfect for the office, and I love the bright punchy red/orange shade. The photos don't do it justice, as for some reason my camera fails at capturing this particular hue. 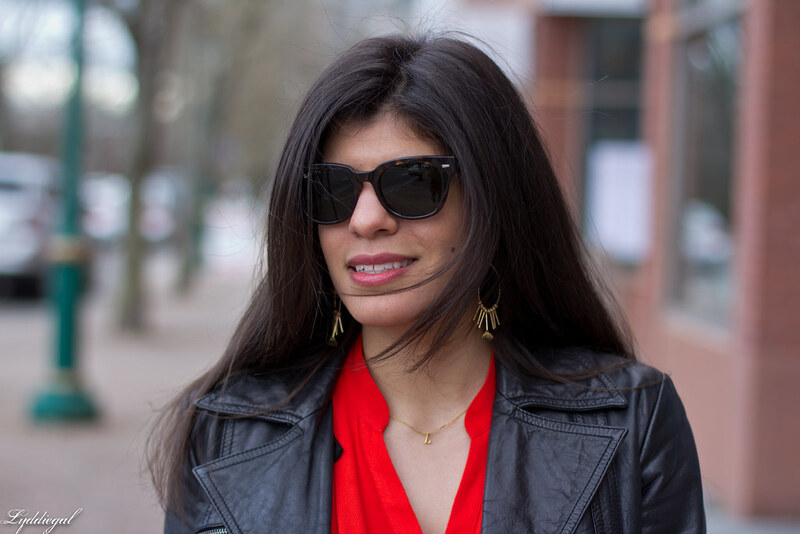 While this was a particularly chilly day - I've got my wool cardigan on underneath and nylons under my jeans - this saturated shade does well to liven things up, and I'm already counting the days until I can pair it with a cute pair of white shorts. 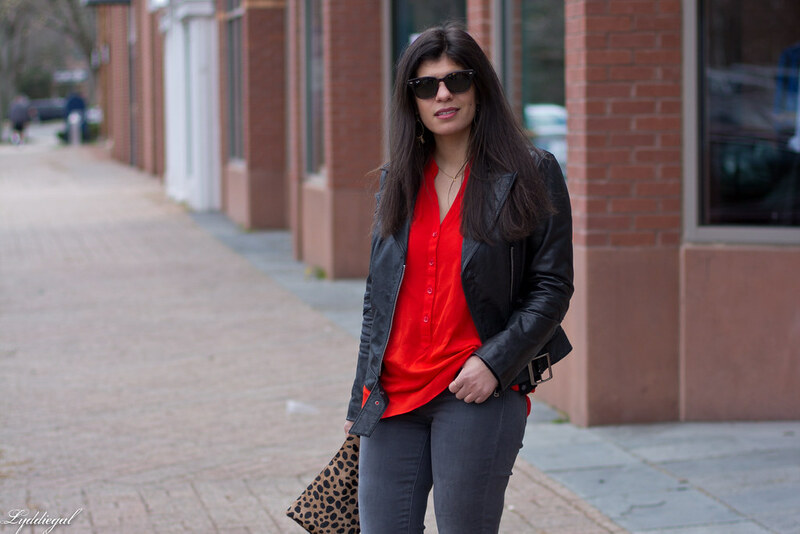 While I know I wouldn't feel comfortable in this shade of orange red for more than a few seconds, I love the way it livens up the grey and black shades in your outfit. 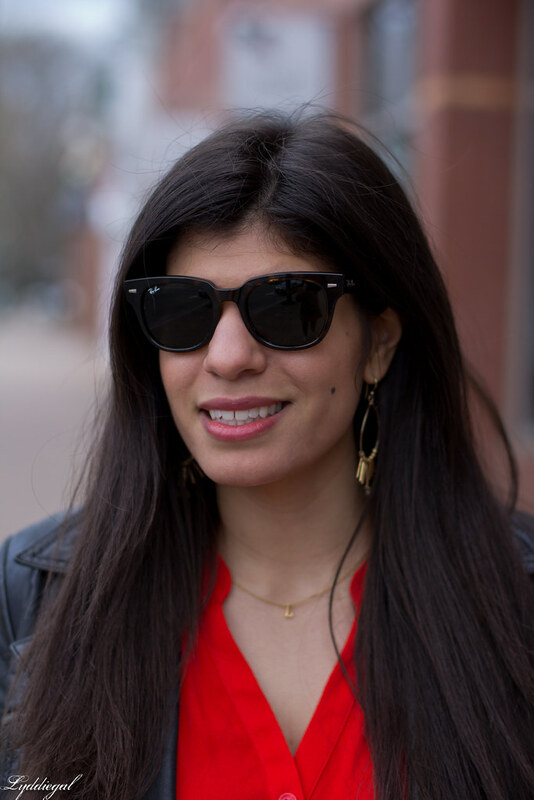 Although admittedly I do feel like I will love it even more with white shorts, these photos go to show that there's no reason you can't wear a bright shade in the winter months, as long as you know how to style it well! Red/orange looks STUNNING on you. I love, love, love how it brings out your skintone and really makes your features POP! 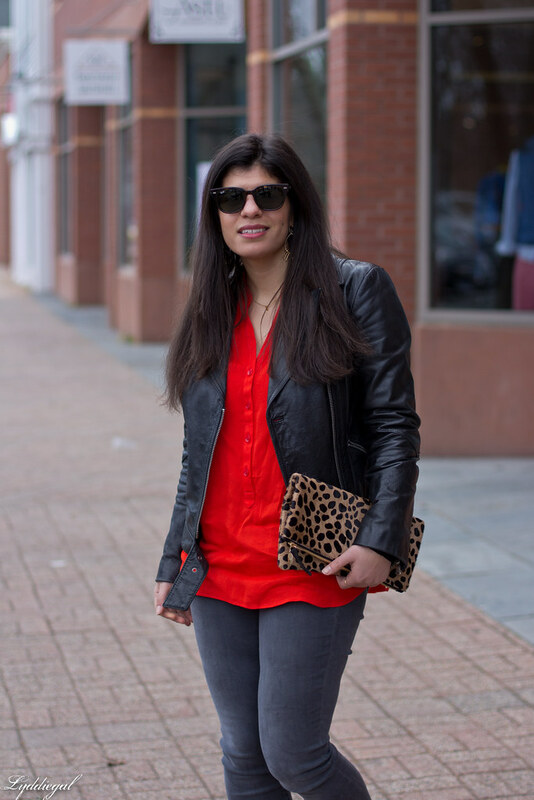 That top is seriously stunning - and that bold color is really working for you! Unsurprisingly, I'm pretty partial to the way you've styled it here but I can't wait to see what else you wind up pairing it with. Ooh gorgeous, I love the color of that top! It's great against the dark neutrals but you're right, it will be just as pretty with white shorts this summer! 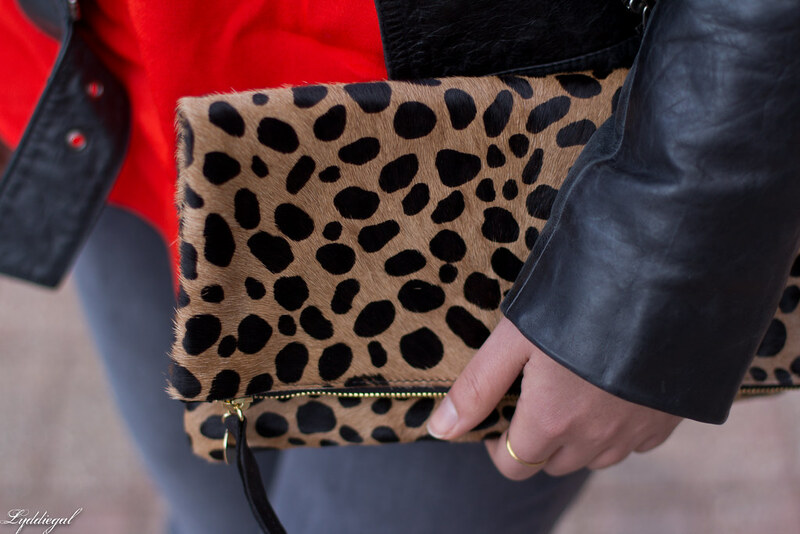 I really love that leopard clutch! I was so tempted to get it during the Shopbop sale! It looks great with the bright top! I hate when the camera doesn't capture the color right, but that color looks so amazing on you! And I love how you styled it with the black and grey! Just last night I was looking for a bright red to wear tomorrow and all the tops I had in similar shades were kinda dull.. 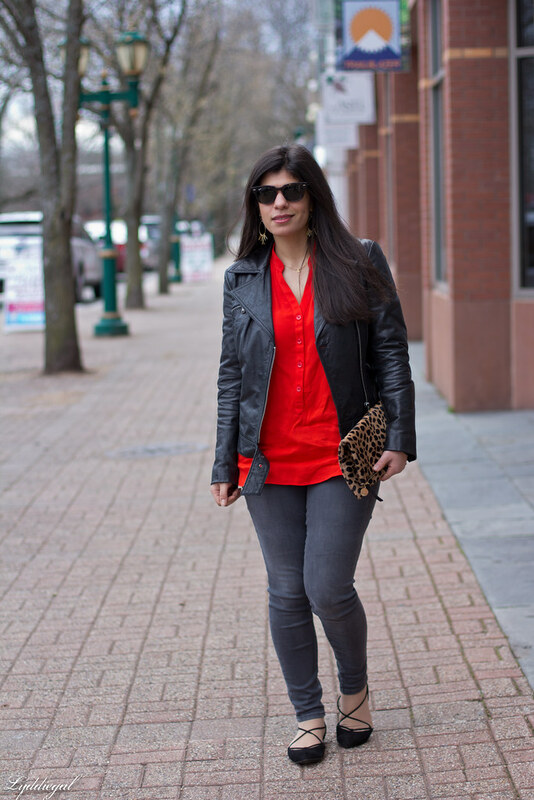 I love the pop of leopard! So lovely against the red top! lovely shoes! you look so relaxed! The shoes and that jacket are extremely beautiful. Love this style.